We're pleased to announce our spelt product range is now accredited by The Vegetarian Society as Vegan. The Vegan Trademark offers assurance to consumers that stringent checks have been made to ensure a product’s vegan credentials, making it easier for shoppers to recognise a product that’s free from animal ingredients. 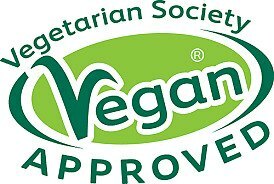 Commenting, our founder Roger Saul said, “We’re delighted that our relationship with the Vegetarian Society continues to grow through our Vegan accreditation. We very much hope to inspire this passionate community to try our organic spelt as it’s not only packed with health benefits but possess a fantastic nutty flavour. This year we launched our first bread range for Marks and Spencer which has seen great success and we believe this is due to the flavour and health benefits of spelt”. We support the 2018 food prediction that veganism will be one of the biggest trends this year. Due to a growth in understanding of the environmental cost of meat production, including its impact on greenhouse gas emissions, and the issue of agricultural run-off, many are beginning to feel that a plant-based diet is more sustainable. Ancient grains like spelt are a fantastic alternative to meat and are projected to grow in popularity for those living on a vegan diet because they are easy to digest, versatile, and boast nutritious qualities such as being a good source of protein which is important when making sure the body gets the nourishment it needs. The Vegetarian Society has been registering products with the Vegan Trademark since March 2017. Their Vegetarian Trademark can be found on more than 15,000 products and they are confident that this Vegan Approved Trademark will experience the same success.